(video) An aerial lift going down Mount Tsukuba in Ibaraki, Japan. 8-passenger gondola lift in Panticosa Ski Resort, Spain. Plateau Rosa aerial tramway, in Cervinia, Italy, moves 120 people at a time to 3480m glacier. An aerial lift (US), also known as a cable car (UK, Europe), is a means of cable transport in which cabins, cars, gondolas or open chairs are hauled above the ground by means of one or more cables. Aerial lift systems are frequently employed in mountainous territory where roads are relatively difficult to build and use, and have seen extensive use in mining. Aerial lift systems are relatively easy to move, and are and have been used to cross rivers and ravines. In more recent times, the cost-effectiveness and flexibility of aerial lifts has seen an increase of gondola lift being integrated into urban public transport systems. Aerial tramway in Engadine (Switzerland) suspended on two track cables with an additional haulage rope. A cable car (British English) or an aerial tramway, aerial tram (both U.S. English) is a type of cable car which uses one or two stationary ropes for support while a third moving rope provides propulsion. The grip of an aerial tramway is fixed onto the propulsion rope and cannot be decoupled. Aerial trams used for urban transport include the Roosevelt Island Tramway (New York) and Portland Aerial Tram. 2-cable gondola lifts to Ngong Ping village in Hong Kong built by Leitner Group. A gondola lift is a type of cable car, which is supported and propelled by cables from above. It consists of a loop of steel cable that is strung between two stations, sometimes over intermediate supporting towers. The cable is driven by a bullwheel in a terminal, which is connected to an engine or electric motor. They are often considered continuous systems since they feature a haul rope which continuously moves and circulates around two terminal stations. Depending on the combination of cables used for support and/or haulage and the type of grip (detachable grip vs. fixed grip), the capacity, cost and functionality of a gondola lift will differ dramatically. Because of the proliferation of such systems in the Alpine regions of Europe, the French language name of Télécabine is also used in an English language context. Gondola lifts are also used for urban transportation. Examples include the Singapore Cable Car, Ngong Ping Skyrail (Hong Kong), Metrocable (Medellín), Metrocable (Caracas), Mi Teleférico (La Paz), and Emirates Air Line (London). Gondola lifts should not be confused with aerial tramways as the latter solely operates with fixed grips and simply shuttles back and forth between two end terminals. Ropeway conveyors are typically found around large mining concerns, and can be of considerable length. The COMILOG Cableway, which ran from Moanda in Gabon to Mbinda in the Republic of the Congo, was over 75 km in length. The Norsjö aerial tramway in Sweden had a length of 96 kilometers. A funitel is a type of cable car, generally used to transport skiers, although at least one is used to transport finished cars between different areas of a factory. 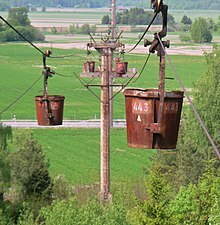 It differs from a standard gondola through the use of two overhead arms, attached to two parallel overhead cables, providing more stability in high winds. The name funitel is a blend of the French words funiculaire and telepherique. When used to transport skiers, funitels are a fast way to get to a higher altitude. However, because skis or snowboard have to be taken off and held during the trip, and because of the (usual) absence of seats, funitels can sometimes be uncomfortable for long trips, in the same way other large gondolas can be. Funitels combine a short time between successive cabins with a high capacity (20-30 people) per cabin. A Funifor is a type of cable car with two guide ropes and a haul rope loop per cabin. The Funifor design is patented by Doppelmayr Garaventa Group. Two reversible cabins run on parallel tracks. The drives of the two cabins are not interconnected. At the top of each track, the haul rope for that track loops back to the bottom instead of looping over to serve the other track as occurs with a normal aerial tramway. This feature allows for single cabin operation when traffic warrants. The independent drive also allows for evacuations to occur by means of a bridge connected between the two adjacent cabins. The main advantage of the Funifor system is its stability in high wind conditions owing to the horizontal distance between the two guide ropes comprising each track. In developing countries with rough terrain, simple hand-powered cable-cars may be used for crossing rivers. Examples include the tuin used in Nepal. An elevated passenger ropeway, or chairlift, is a type of cable car, which consists of a continuously circulating steel cable loop strung between two end terminals and usually over intermediate towers, carrying a series of chairs. They are the primary onhill transport at most ski areas (in such cases referred to as 'skilifts'), but are also found at amusement parks, various tourist attractions, and increasingly, in urban transport. Depending on carrier size and loading efficiency, a passenger ropeway can move up 4000 people per hour, and the fastest lifts achieve operating speeds of up to 12 m/s (26.8 mph; 43.2 km/h). The two-person double chair, which for many years was the workhorse of the ski industry, can move roughly 1200 people per hour at rope speeds of up to 2.5 m/s (8.2 ft/s). The four person detachable chairlift ("high-speed quad") can transport 2400 people per hour with an average rope speed of 5 m/s (16.4 ft/s). Some bi and tri cable elevated-ropeways and reversible tramways achieve much greater operating speeds. Fixed-grip lifts are usually shorter than detachable-grip lifts due to rope load; the maximum vertical rise for a fixed grip chairlift is 300–400 m (984.3–1,312 ft) and a length of about 1,200 m (3,937 ft), while detachable quads and "six-packs" can service a vertical rise of over 600 m (1,969 ft) and a line length of 2,000 m (6,562 ft). Detachable quad chairlift grip. (Chair is on a sidetrack). This type of grip can be seen on Dopplemayr high speed quads built between 1985 and 1995. A detachable chairlift or high-speed chairlift is a type of passenger cable car, which, like a fixed-grip chairlift, consists of numerous chairs attached to a constantly moving wire rope (called a haul rope) that is strung between two (or more) terminals over intermediate towers. They are now commonplace at all but the smallest of ski resorts. Some are installed at tourist attractions as well as for urban transportation. The significance of detachable chairlift technology is primarily the speed and capacity. Detachable chairlifts move far faster than their fixed-grip brethren, averaging 1200 feet per minute (13.6 mph, 6 m/s) versus a typical fix-grip speed of 500 ft/min (5.5 mph, 2.5 m/s). Because the cable moves faster than most passengers could safely disembark and load, each chair is connected to the cable by a powerful spring-loaded cable grip which detaches at terminals, allowing the chair to slow considerably for convenient loading and unloading at a typical speed of 200 ft/min (2.2 mph, 1 m/s), a speed slower even than fixed-grip bunny chairlifts. Palm Springs, California Aerial Tramway – a car climbing from the valley station below. ^ a b "Funifor". Doppelmayr Garaventa Group. Retrieved 2010-12-10. ^ "Doppelmayr: A convenient trip to the Portavescovo with the Funifor". ropeways.net (SEC - Software Engineering Center, Wanker & Viehauser OEG). 2006-08-11. Archived from the original on 2007-09-28. Retrieved 2007-01-13. ^ "Tuin river crossings". Practical Action. Retrieved 2012-06-09. ^ "Aerial Ropeways in Nepal". Appropedia. Retrieved 2012-06-09.